Young children will find The Perfect Pillow to be the perfect bedtime companion. 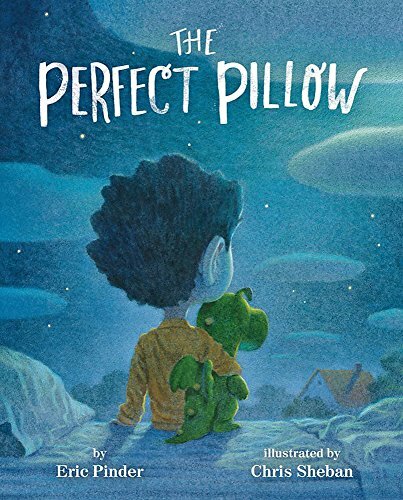 The story depicts a timeless problem most children experience: sleeplessness. Young Brody tosses and turns in his bed in his new house. Sleep eludes the youngster so he goes in search of the perfect pillow. His companion in this quest is Horst, his stuffed dragon friend. Will Brody find his perfect pillow? Chris Sheban’s creative illustrations are a beautiful addition to the story. This accomplished artist brings Brody, Horst, and a host of other creatures to life. The colors have a dreamy quality to them, and nighttime in Brody’s world is luminous and warm. The illustrations have a slight touch of spookiness that is sure to interest older readers. Picture books are easy to read and enjoy, but require a lot of effort to write. The vocabulary has to be tantalizing without being patronizing to young children. The story has to be interesting and told within a few pages. Both adult and child should enjoy reading the story. And lastly the words and pictures have to be in harmony. When all these elements work together, a perfect book is born. That is what has happened within the pages of The Perfect Pillow. Enjoy over and over again with your child.